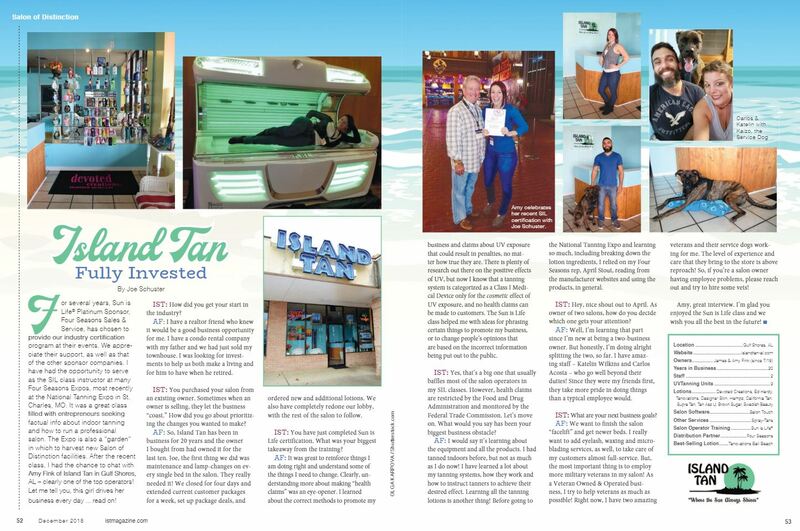 Island Tan – "Where the Sun Always Shines"
IST Magazine’s Salon of Distinction December 2018! We offer the finest tanning equipment in the area! Featuring our Wolff System computer controlled tanning units. We have our 12-minute KBL 5600 bed featuring 4 Facial Tanners, aroma therapy, air condition, body misters, contoured acrylic and your personal Stereo/MP3 system for the ultimate relaxation during your tanning experience. UltraSun 20-minute beds perfect for base building and relaxation and for people “on the go”, KBL 3500 12-minute with facial tanners and 12-minute Sundash stand-up units for the “all over” 360* tanning. Our salon computer tracks your visits and your tanning time, so you get what you paid for and it tracks bed and bulb usage so that our equipment is maintained and bulbs changed to maximize your tanning experience. Convenience – No appointment is ever necessary at Island Tan. You can visit us at your convenience we are open 7 days a week, 355 Days a Year. Innovation – Our “State of the Art” air conditioning system was specially designed for our salon to ensure that your tanning experience will be the coolest you’ve ever had. A second air system pumps cool air through each tanning bed for your tanning comfort. Safety – Your tanning time is monitored by computer to ensure that you are always carefully tanned. Our trained staff is Sun is Life Certified, so that you can feel confident in seeking our advice. Because we specialize only in tanning you get the best tan safely. Cleanliness – A sparkling clean facility is our way of showing you that we appreciate your business and are concerned about your tanning safety. We clean our tanning beds after each use so you can relax and enjoy your tanning experience without any worries.